My middle son brings his lunch to school everyday and it is really hard to find something he will eat pull something I think is good for him. Not only having the lunch problem he always comes home ready for a snack after school . 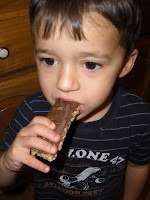 With my toddler during the day I also want something that is healthy for him that he will eat !!! I was excited to learn that Warner Bro. Consumer products has partnered exclusively with Safeway to offer a “better for you” eating solution for kids. This product line features more than 60 items across 18 categories including breakfast foods, produce, portable meals, dairy, snacks, beverages and even frozen entrees and is available in more than 1700 Safeway locations throughout US and Canada. We received a sample of theses great products on the right. All of my boys enjoyed them...even my PICKY 10 yr old. The pasta was more than enough to fill him up and he thought it tasted great ! My 2 yr old really enjoyed the fruit cup and the bar. What I like best about the Eating Right Kids line is that these are foods that all of my boys are already familiar with. Nothing strange which make it easier to get them to try it. I also like the portion size of the items. 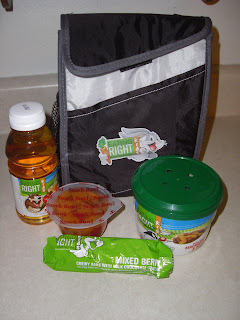 The Products from the Eating Right Kids line cover breakfast, lunch, after school snack and a quick dinner! The next time you’re at Safeway, don’t forget to stock up on some of these items and help promote healthier eating!